2019 will be a big year for Lyman. This company is rolling out a number of new products, including three unveiled today: a variable-speed case trimmer, a universal press stand, and a really nice shooting mat. We think all three products offer some very cool features and a lot of performance for the price. 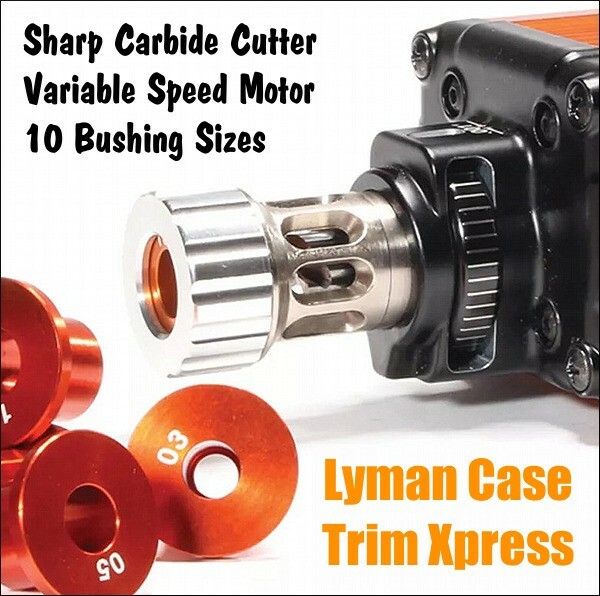 For 2019, Lyman offers the Case Trim Xpress, a new, affordable variable-speed case trimmer with a razor-sharp CARBIDE CUTTER. Available in either 115V or 230V, the Case Trim Xpress can quickly and accurately trim brass at a rate of approximately 15 cases a minute. The unit has its own power source, and a strong variable-speed motor, so there is no need to use power drills. Using the 10 provided bushings, the unit indexes off the case shoulder — that’s simple, fast and reliable. Plus a precision trim adjustment wheel allows case lengths to be easily “dialed in” to 0.001″ increments. To trim your brass, simply push the case against the carbide cutter until the shoulder stops on the bushing (with precise case OAL set by the wheel). The Case Trim Xpress comes with 10 bushings that fit the most popular bottleneck rifle cartridges, so no pilots are needed. Expected retail price is around $140.00. Comes with 10 bushings fitting the most popular bottleneck rifle cartridges — no pilots needed. 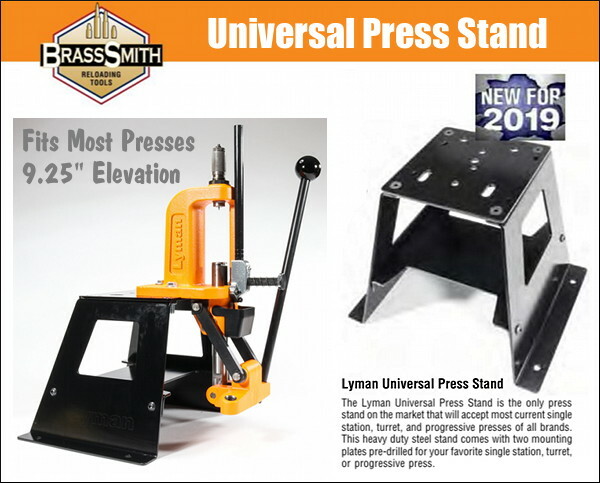 Lyman says that its new Lyman Press Stand is the only press stand on the market that will accept most current single station, turret and progressive presses of any brand. The stand is heavy-duty steel for strength, pre-drilled for common presses. It will elevate your press 9 ¼” above the bench, providing a clear view of all reloading operations while keeping the operator in an upright, back-healthy position. Raising your press can reduce fatigue while giving you extra room (below) to hold bullet boxes and dies. 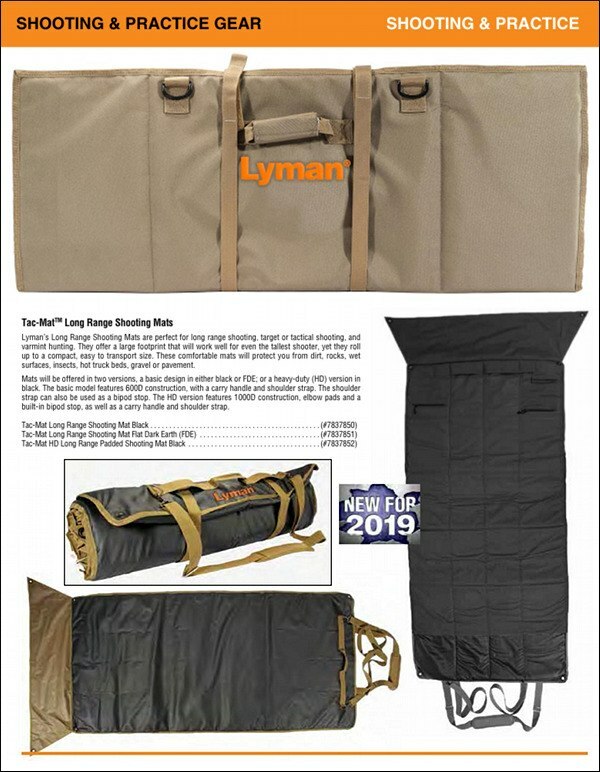 For 2019 Lyman will offer new Tac-Mat Long Range Shooting mats — in both standard and HD padded versions. These mats are long enough for tall shooters, but they still can be rolled into a compact, easy to transport size. The Tac-Mat will be offered in two versions: a basic design in 600D construction with a carry handle and shoulder strap, or the heavy-duty version (HD) in 1000D construction with elbow pads, a built-in bipod stop, carry handle and shoulder strap. We like these new mats — a lot of smart thinking went into their designs and features. 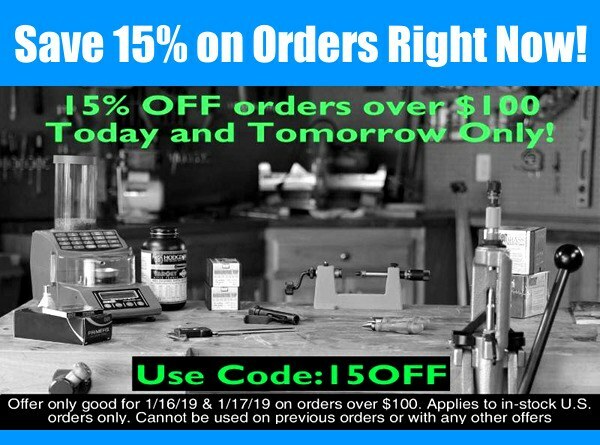 Want more info on all Lyman products? Click this link for Complete 2019 Lyman Product Catalog. 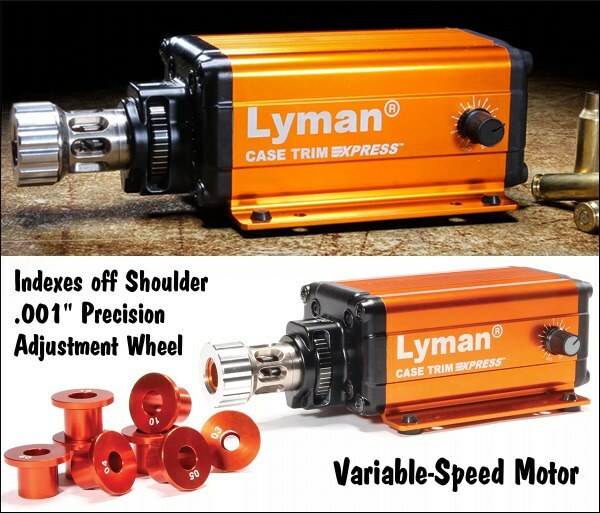 Share the post "Cool New Products from Lyman for 2019 — All Winners We Bet"
One of the first things new reloaders notice is that load data varies between reloading manuals. The Sierra Bullets Technicians frequently get inquiries asking us to explain why the load data appears to be inconsistent. This article explains five key factors that can influence published load data. Basically, the similarities in the .30 caliber 168 grain Match bullets (for example) end with weight and diameter. The bullets likely have dimensional differences such as bearing surface length. Bearing surface has a large effect on pressure and velocity. There are also differences in boat tail, flat base, ogive and over-all lengths, which each help determine the cartridge over-all-length (COAL). With different COAL’s, we can expect changes in pressure and velocity also. In some calibers there are differences in bullet diameter with different bullet manufacturers. It is also worth noting that bullet manufacturers do not all use the same copper alloy for their jackets. This produces more or less friction that results in load pressures and velocities. The solid copper bullets also vary quite a bit in comparison to a lead core and copper jacketed bullet. Each gun is unique, even if you are using the same make, model, and caliber. Special consideration should be used to consider that not all firearm chambers are the same either, creating more variables that need consideration. There can be drastic differences in the throat length. This controls the amount of “jump” that a bullet experiences when the cartridge is fired. Within normal manufacturing tolerances, you can see some variation in a given powders burn rate between different lots of the same powder. So naturally when two different Manuals are produced, it would be doubtful that the same lots would be tested. New cases are almost always near minimum specs in dimension. A load fired in a new case would likely have slightly more pressure that when fired in a re-sized case. This would certainly be true if we were loading into fire-formed cases that have had minimal re-sizing done. Fired cases that are full length resized most of the time be slightly larger than the new unfired cases. This gives you differences in case capacity. The same powder charge placed within a new case and a full length resized case will produce different pressure levels and probably different velocities. Temperature can cause pressure increases or decreases. Hot temperatures tend to cause pressures to increase, while cold temperatures will usually do the opposite. Humidity and altitude can impact pressures and velocities likewise. Remember that you may or may not reach the same maximum load safely. There is no “one load fits all bullets.” The minimum load data offers a safe place to start. The maximum load data listed should always be regarded as a safety guideline and not necessarily a goal! Your gun should shoot accurately without breaching the maximum load data. The best advice is: always start low and work your load up! If you have questions about variances in load data or other reloading questions, please call our ballistic technicians at 1-800-223-8799 or send us an email at sierra [at] sierrabullets.com. Share the post "Variances in Load Data — Why Load Manuals Don’t Always Agree"